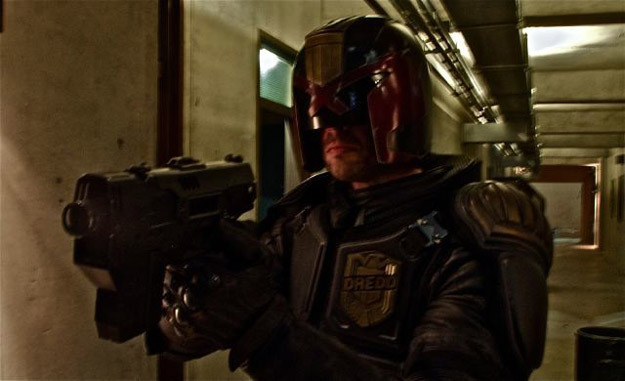 While there’s already a lot of excitement for all the superhero movies coming out in 2011, one project that has remained relatively low-key is the return of 2000 AD star Judge Dredd in the Pete (Vantage Point) Travis-directed Dredd, starring Karl Urban as Mega City One’s brutal enforcer. The 3D movie is about to start production with Lionsgate planning to release it once it’s done. Artist Jock, who has drawn Judge Dredd in the comics as well as being the concept artist for the movie, shared the picture below which gives us our first look at Karl Urban as Judge Dredd, helmet and all, from rehearsals. Let us know what you think about how the new Dredd looks compared to Sylvester Stallone’s take on the character from the 1995 movie… or instead, we can just pretend that movie never happened and hold out hope for this new one.